Need a breathtaking minimalist WordPress theme for your next website? If you’re a writer, photographer, or any other type of creative, minimalist design is a great aesthetic choice for your portfolio site or blog. And even if you’re not, you can still kick the clutter to the curb and go with a nice simple theme! But this is a post about minimalism! So I’m going to keep the text minimal and jump straight into the themes…. Alpha is another stellar minimal portfolio theme for all types of creatives. It’s got a custom slider, plenty of AJAX integrations, and lots of other smooth animations. If you’re looking to provide an immersive, but minimal, experience, this is the theme for you. Adios is a minimalist portfolio theme for artists, agencies, freelancers, or any other type of creative. It ships with 9 different homepage demos, most of which put a heavy emphasis on visuals. It also ships with Visual Composer for easy page building, as well as a number of different post formats for portfolios, case studies, and more. Breeze is a minimalist, block-based WordPress theme built specifically for bloggers looking to make their words the center of attention. While some of the blog styles straddle the minimalist line, the core homepage sports a beautiful simple design. Aurum is another simple WordPress theme from Laborator, the same company behind the Kalium theme featured above. 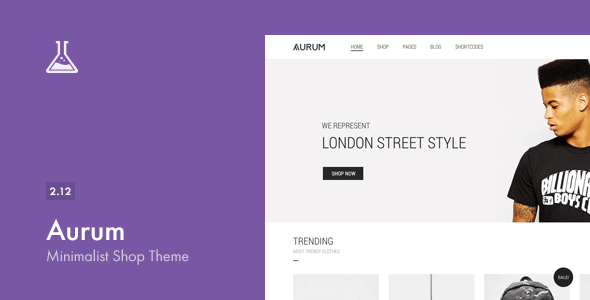 While Kalium is multipurpose, Aurum is specifically positioned as a minimalist WooCommerce theme more in the vein of Savoy. It’s a great option for all kinds of eCommerce stores that fit with the minimalist aesthetic. 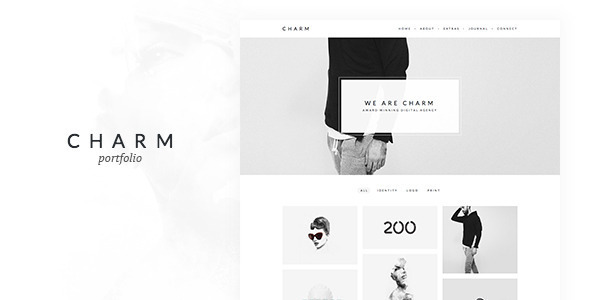 Charm is an ultra-minimalist design for creatives looking to showcase their portfolio. It includes tons of advanced portfolio functionality to make that as easy as possible. And it also makes full use of the native WordPress Customizer for easy theme changes. 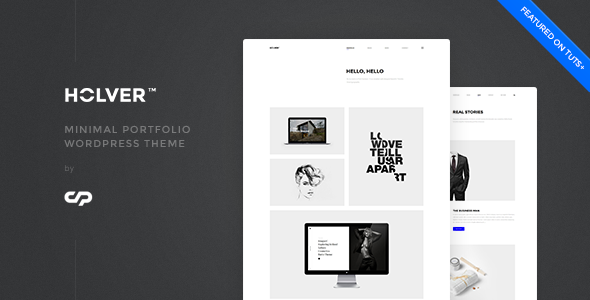 Holver is another stunning minimalist portfolio that’s perfect for creative agencies or other creative freelancers. It comes with a variety of different portfolio layouts. And you also get lifetime upgrades with your purchase, which offers great value for your money. It doesn’t have a ton of sales yet, but the author is an Envato Elite Author. 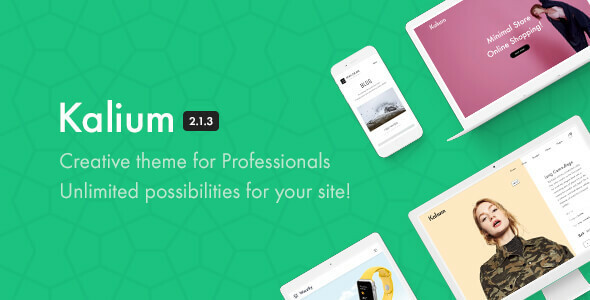 Kalium is an exceptionally popular multipurpose theme from Laborator. As part of its multipurpose functionality, it includes a bevy of premade website concepts. And while not all of these concepts are minimalist, there are a few different quality minimalist designs covering websites for agencies, photographers, freelancers, eCommerce stores, and more. If you’re looking for something that’s both flexible and minimalist, Kalium is a great option. Its impressive 4.91-star rating on over 14,000+ sales is proof enough of that! 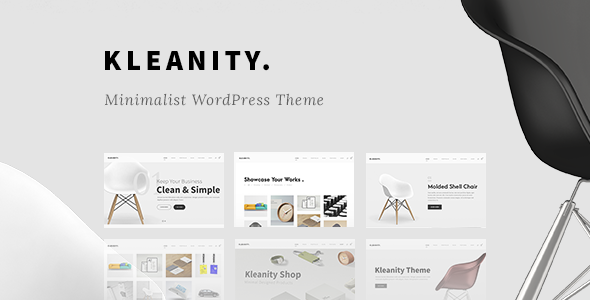 Kleanity is a stylish minimalist theme from GoodLayers. You can use it to showcase your portfolio or for your WooCommerce store. 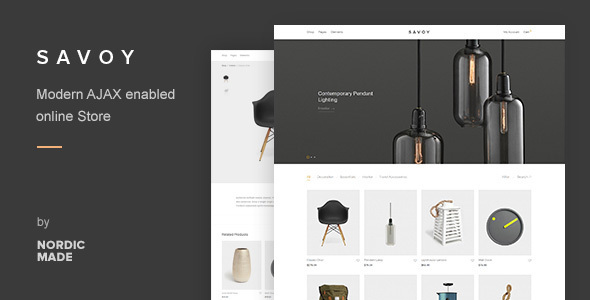 The WooCommerce design bears a similarity to Savoy’s minimal Nordic design, and the portfolio has a gorgeous focus on the visual. Core is a gorgeous minimalist WordPress theme for photographers looking to create a portfolio. While its heavy emphasis on imagery might not work for all types of sites, anyone who deals in images or artwork will love this simple theme. 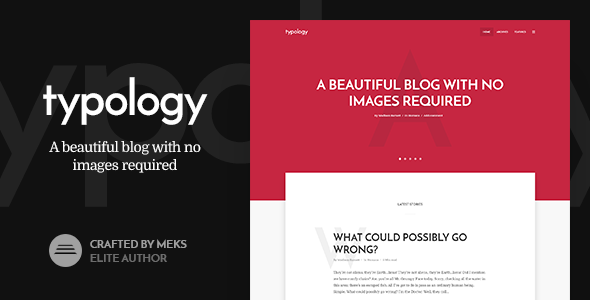 Typology is a bold, text-based minimal WordPress theme. While it doesn’t have quite the sales numbers as the other themes on this list, I’m a huge fan of the simple text styling. While other themes rely on images, Typology draws its beauty strictly from typography. 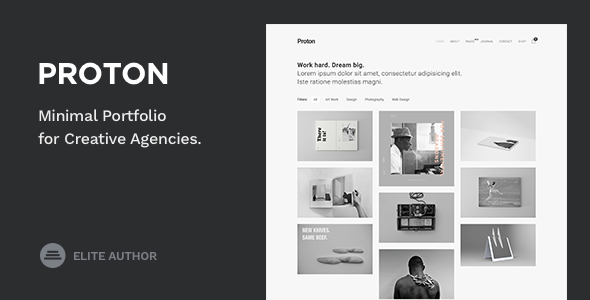 Proton is another portfolio-based theme that ships with a number of different minimalist layouts. You get 6 different homepage layouts, a variety of portfolio types, and full WooCommerce support with an AJAX shopping cart. Savoy is what you’d get if Ikea developed its own WordPress theme. That is, it’s beautiful and minimalist. And while Savoy is built specifically for WooCommerce, it also includes a number of different blog pages so that you could, if desired, use it for a multipurpose site. Still, Savoy’s WooCommerce store looks so beautiful that it would be a shame not to take advantage of the WooCommerce compatibility. 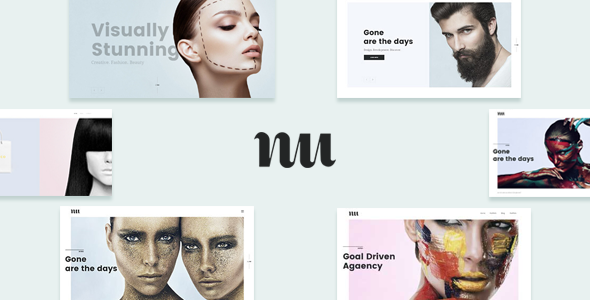 The creatively named Minimal WordPress theme offers you a minimalist, typography-driven WordPress theme to display your latest work. It’s the perfect minimalist theme for bloggers, writers, or anyone else whose work is primarily driven by text. It’s also lightweight, which is great for ensuring quick page load times. Like Kalium, Soledad is another multipurpose WordPress theme that includes a bevy of stylish minimalist designs. In total, Soledad ships with a massive 900+ demo homepages. So while it’s not minimalist when it comes to features, it is minimalist on the front-end. My personal favorite is the simple blog theme. 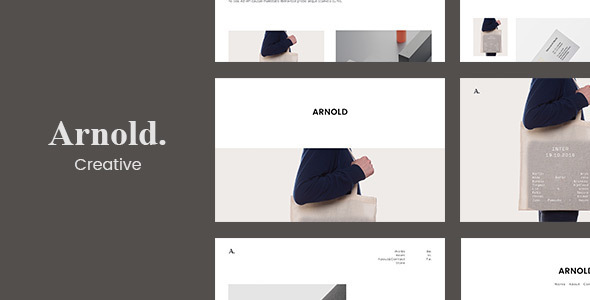 With some of its homepage demos, Arnold takes minimalist design to a whole new level. Beyond that, it also includes a dedicated portfolio builder to help you showcase your work with drag and drop. And it also offers 7 different header layouts for you to tweak your navigation. And that just about wraps up my list of the top minimalist WordPress themes. I’m a huge fan of minimalist design, so this list was a blast to make. But, as is usually the case with theme lists, there are way more than 15 quality minimalist themes out there. So if I missed a great simple design, I’d love if you left a comment so I can add it to my repertoire.